Be mesmerized by Milford Sound on a full-day trip from Te Anau to Queenstown. 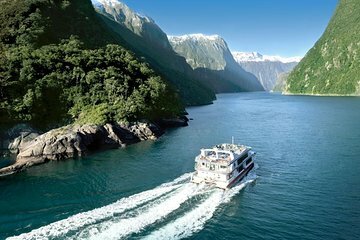 Travel through World Heritage–listed Fiordland National Park and go sightseeing on a Milford Sound cruise past majestic Mitre Peak. Enjoy a buffet lunch or opt for a Japanese-style bento box (if selected). Includes hotel pickup and drop-off with commentary on board the coach and cruise boat. Concludes at Queenstown at approximately 7:45pm, Most Hotel drop off is available please advise prior to travel. Relax aboard a luxury coach on a driving tour from Te Anau to Queenstown, taking in the rustic alpine landscapes before your cruise on Milford Sound. After hotel pickup, depart through the Southern Alps and pass through the Eglinton Valley, bordered by steep, glacier-carved rock sides. Your driver-guide provides narration on the panoramic landscape of alpine beech forests and Mirror Lakes, where you’ll disembark the coach for photo ops. Then motor through the Upper Hollyford Valley and past Christie Falls before entering the Homer Tunnel toward the Cleddau Valley, finally descending into Milford Sound. Here, board your catamaran for a scenic cruise. Watch waterfalls tumble from mist-shrouded or snow-capped rock walls that rise 3,937 feet (1,200 meters) from the fiord. Pass breathtaking Mitre Peak, and be on the lookout for marine life such as Fiordland penguins, bottlenose dolphins and fur seals that your nature guide describes. Enjoy a buffet lunch or opt for a Japanese-style bento box (if selected). After your cruise, rejoin your coach for the journey to Queenstown, where you will be transferred to your hotel. We had a beautiful day for this tour, so it was warm enough to stay on deck most of the time. Take your raincoat for the close-up of the last waterfall We were lucky enough to see a penguin, and fur seals. You can really see where the glaciers cut the rock face. Gorgeous views - if you want to see more impressive waterfalls, go on a rainy day. Wie immer bei den Kiwis perfekt organisiert, wenn auch die touristische Massenabfertigung gelegentlich nerven kann. Den Milford Sound muss man aber gesehen haben, auch die Busfahrt dorthin ist schon grossartig !